While I love mackerel fried in nothing but a bit of butter, this fish can handle the heat of spices. This is a recipe for utterly tasty marinated mackerel fillets. Mackerels are loaded with super-healthy Omega 3 fats, the type of fats that our brains and bodies depend upon. Oily fish is the best source of omega 3 and mackerel is pretty much at the top of fish rich in Omega 3 (see Fourth of May Diary). My only problem with mackerel is that unless I can manage to buy really fresh ones, I’m not that fond of them. This is not a type of fish that you should buy and leave in the fridge for a day or two. My dream scenario is eating them more or less as soon as they are out of the sea – which luckily I’ve been able to do at times. You can serve these marinated mackerel fillets with citrus-infused couscous. Check out the citrus couscous I make with my Ginger-Glazed Salmon recipe – another super-tasty fish dish loaded with Omega 3. Or - for a lighter meal - eat them with a salsa like my Mango Salsa or a salad. The last time I made these mackerel fillets for myself, I ate them together with my Carrot and Quinoa Salad –YUM! 1. 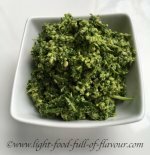 Dry-fry the fennel, cumin and coriander seeds in a frying pan over a medium heat for about a minute – stirring frequently – until fragrant. Place the roasted seeds in a pestle and mortar and grind to a coarse powder. 2. In a bowl, mix together the ground seeds with all the other ingredients for the marinade. 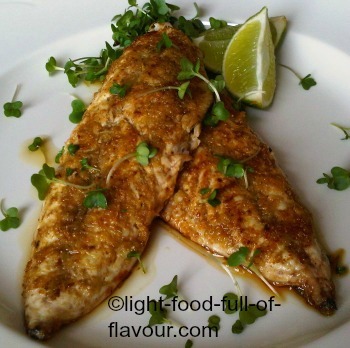 Place the mackerel fillets flesh-side up on a plate and divide the marinade over the fillets. Leave to marinate for 10 minutes. 3. Add the oil to a large non-stick frying pan over a high heat. When the oil is really hot, place 2 mackerel fillets - skin-side down - in the pan. Fry the fillets for about 1 – 1½ minute, until the skin is nicely browned and crisp. Carefully turn the fillets over and fry for a further minute. Remove the fillets and keep them warm while frying the remaining fillets.